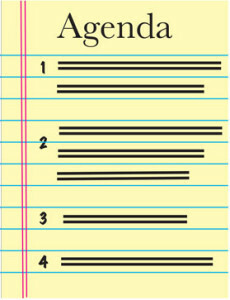 Proposing an agenda creates the appearance of thoughtful preparation in little time. Some sales people suffer from the problem of transitioning from social chit-chat to the inquiry and presentation about needs and solutions. Some prospects too will go on and on about their favorite team or kids or even the weather. While building rapport is an important part of sales, having an agenda prepared, in your head or on paper, makes it easy to say something like; “To make sure we cover what you want to cover today I drafted a quick agenda, but first, can you believe that rainstorm?” This will put you right where you want to be, lightly but firmly in control of the conversation. When you propose the right agenda it can immediately give you an “easy yes” on the path toward the harder to achieve yes — closing the deal. Suggesting an agenda will give you a chance to ask what other things the prospect would like to make sure are covered, providing your first opening to ask an open-ended question, engaging the prospect and getting them out of their “me buyer, you supplier” shell. Proposing an agenda at the beginning of a sales call has the effect of leveling the playing field from a ‘supplier-buyer’ relationship to a professional-to-professional conversation. In major account and national account advertising sales one of the chief challenges is just getting an important decision-maker to take time for a meeting. By proposing an agenda, in advance — in the process of asking for the meeting, an you can help the prospect see that you propose to discuss something interesting, rather than just brow-beat them about why your property is better than the competition, or when they’ll advertise next. In the world of national advertising sales, sales executives rarely know enough about the needs of or opinions of the prospects while going into a meeting. It is well-known that asking more questions is a key to more successful sales conversations. Proposing an agenda at the beginning of your media-sales conversation can allow you to specifically ask for permission to ask questions. Then, breaking out of the “We’ll send you an RFP” situation — that puts you in the same hopper with your competition — can be solved in part, too, with an agenda. When you put a “hypothetical proposal for your comment” on the agenda, and the prospect says “okay” to the agenda, you will have received permission to get the prospect to tell you what you later need to propose to win the business. Finally, when you put “next steps” on the agenda, you have structured the conversation to get to the reason you are there, to move the ball forward to a sale. In most ad-sales situations, an on-the-spot sales isn’t a possibility, but clarity about next steps is the key to winning. Put it on the agenda. 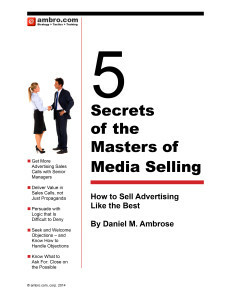 Find more advertising sales tips here.